Just in time for summer, meet your friends and family for free live music every Wednesday evening from 6-9 pm. Fresh Hamburgers, Riders Sausage and Beef Hot Dogs are available for purchase as well as Sodas, Ice Harbor Beer, Full Bar with our signature Salty Dogs and freshly squeezed grapefruit. Check out this line-up: June 14– Colorblind June 21– Tuck Foster and the Tumbling Dice June 28– Shades July 5– Stompin Ground July 12– Coyote Kings with Tiph July 19– Back Roads July 26– Junkyard Jane August 2– Groove Principal August 5– Small August 9– 3rd Date August 16– Blue Tattoo Come out and have some fun with friends and family this summer, on the beautiful waterfront in Kennewick! Thunder on the Island starts June 15! Just in time for summer, meet your friends and family for free live music every Wednesday evening from 6-9 pm. Fresh Hamburgers, Riders Sausage and Beef Hot Dogs are available for purchase as well as Sodas, Ice Harbor Beer, Full Bar with our signature Salty Dogs and freshly squeezed grapefruit. 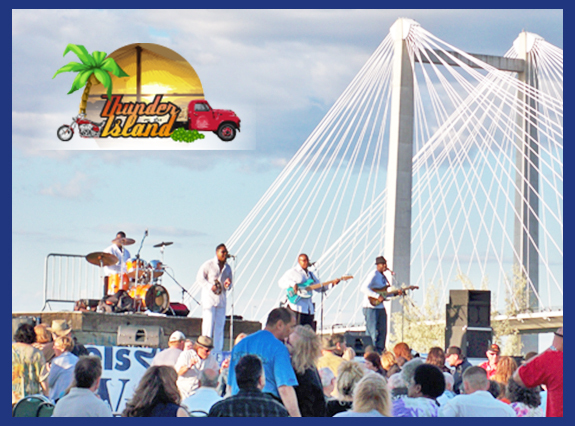 Our Thunder on the Island Lineup: June 15- The Shades -Classic rock and pop music band June 22- Blue Tattoo -Hard hitting classic rock, with an attitude June 29- 3 Legged Dog -Country rock, bluegrass and blues July 6- Abby Road LIVE! -One of the world’s premier Beatles cover bands July 13- Stompin Ground -Newer country rock, classic country and rock n roll July 20- Soundwall -Coolest of the cool, rock n roll for the fans July 27- Junkyard Jane -Swampabilly blues August 3- Fallout -Rock n roll cover band August 10- 3rd Date -Rock n roll, and then some August 17- Wasteland Kings -Americana Come out and have some fun with friends and family this summer, on the beautiful waterfront in Kennewick!